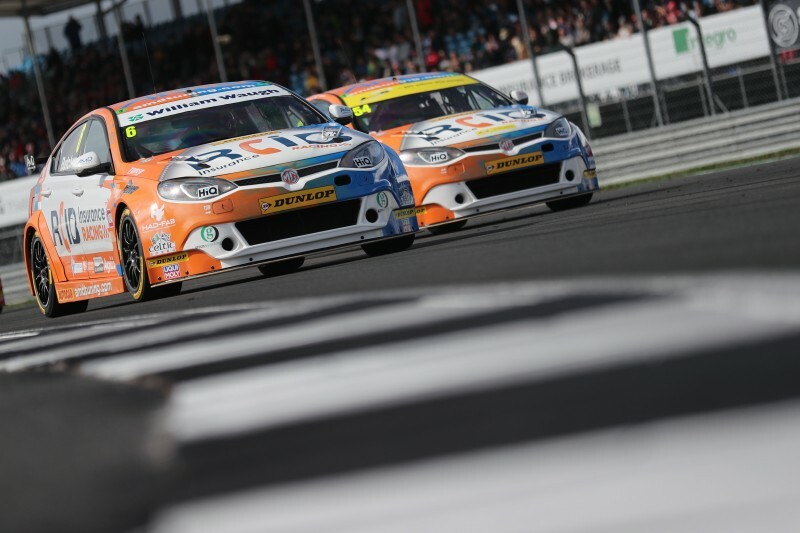 The AmD with AutoAid/RCIB Insurance Racing put more points on the board as the Dunlop MSA British Touring Car Championship headed for Silverstone for the penultimate meeting of the year. The West Thurrock-based outfit headed into the weekend keen to build on three top ten finishes at Knockhill in the previous round, with regular driver Rory Butcher joined by series debutant Josh Caygill. Fife racer Rory qualified 24th on the grid for race one despite his best lap being less than half a second away from pole, showing the ultra-competitive nature of the grid around the short National layout. A stunning performance in the opening race saw Rory charge through the field at the wheel of his MG6 GT, with a number of impressive moves for position seeing him climb up to twelfth spot by the finish. Running the less favourable hard tyre in race two affected his chances of more forward progress as he slipped back to 16th spot by the finish, although the Scot went into race three optimistic about repeating the performance he had shown in race one earlier in the day. Despite early race contact that damaged the side of his car, Rory battled up to 13th place before being forced to pit having picked up a puncture. Rejoining a lap down, he was then the quickest car on track to show the pace of the MG before he brought the car into the pits to retire. Team-mate Josh from Holmfirth in Yorkshire was forced to contend with carrying additional ballast into the weekend as a new entry to the series, which played a part in him qualifying in 30th place for his debut race. Race one was a case of mission accomplished as he brought the car to the finish in 23rd place on the hard compound tyre, but the rookie was then forced to retire from race two when his car started to lose power. The team fitted a new radiator ahead of race three but a misfire developed in the early stages as a legacy of ECU damage from earlier overheating and he was again forced to bring his car in to retire. “Qualifying was a bit frustrating because I know there was more time in the car. However, I kept encountering people in the final sector which meant I couldn’t get the ideal lap, and the extra tenth of a second would have moved up right up the grid with the times being so close. “Race one really made up for it though and we showed strong pace to come through towards the top ten, although we knew race two would be tough on the hard tyre. I think we did well to minimise the places we lost in that one and there is no doubt in my mind that a top ten was possible without the puncture in race three. “The end results have been tough but I’ve had a lot of fun on track this weekend on my debut. The first day was all about getting experience in the car and carrying the weight in qualifying and the opening race was always going to make it tough. I just made sure I stayed out of trouble and made up some places, which is the most I could have done. “The car felt good in the early stages of race two before we lost power and it started to overheat and I was forced to retire. The team did a great job ahead of race three but sadly we had nothing to show for it because there was a misfire that prevented me from continuing. “It’s another weekend where we have shown good pace with the MGs, and it’s a shame we didn’t pick up a few more points from it. We spent a lot of time looking at how to improve the performance of the car in qualifying but sadly couldn’t show it due to traffic, but the race pace was as good as it has been all season. “Rory was particularly impressive in race one to come through the field in the manner that he did and had he not had the puncture in race three, there is no reason why he couldn’t have done it again when you look at the times he was setting.